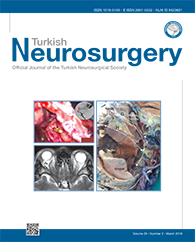 3Malatya State Hospital, Pathology Laboratory, Malatya, Turkey DOI : 10.5137/1019-5149.JTN.22416-17.2 AIM: To evaluate postoperative clinical outcome and recurrence rates in cases with ventrally located spinal meningiomas who underwent Simpson grade 2 resection. MATERIAL and METHODS: We evaluated eight cases (six females and two males; age, 28?86 years; mean age, 60 years) with ventrally located spinal meningioma that underwent surgical treatment in our clinic. The tumors were located in the thoracic region in seven cases and in the cervical region in one case. All cases underwent surgery, which was performed using a traditional posterior midline approach. Laminectomy was unilaterally extended. The case with cervically located tumor differed from the other cases in that a skull clamp was used and laminoplasty was performed. RESULTS: The tumor was completely resected in all cases. Furthermore, in all cases, the tumor nidus that caused the thickening of the dura was cauterized using bipolar cautery and peeled off (Simpson grade 2). The pathological examination of the tumor specimens revealed typical grade 1 meningioma in all cases (fibropsammomatous type, n=1; meningothelial type, n=3; and psammomatous type, n=4). Recurrence was not observed in any of the cases during the follow-up. None of the cases demonstrated postoperative neurological deterioration. At 1 month postoperatively, pain and motor deficit completely improved in all cases, with remarkable improvements of motor deficits in the early postoperative period.